The Parnas sisters are extraordinary musicians. But the cost of nurturing that talent is wrecking their family's finances. NEW YORK (Money Magazine) -- On a Saturday night in January, 400 concertgoers have assembled in a high school auditorium in Newburgh, N.Y. to hear two soloists perform with the Greater Newburgh Symphony Orchestra: teenage violinist Madalyn Parnas and her younger sister Cicely, a cellist. For a quarter hour, the audience listens, rapt, as the sisters and the orchestra play a haunting piece titled LaMuse et le Po�te, a musical dialogue between the violin and the cello by composer Camille Saint-Sa�ns. The Parnas family: Sisters Cicely and Madalyn, with parents Lea and Marcel. 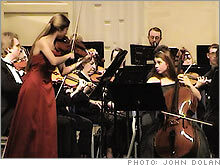 Madalyn and Cicely perform with the Greater Newburgh Symphony Orchestra. As their fingers dance and bows glide, carrying the music's mood from wistful to agitated, the sisters maintain their own silent dialogue. They nod at each other. They smile. They listen intently to each other play, at times with visible joy. The audience starts applauding even before the orchestra sounds the final chords. And when the girls greet the crowd at the concert's close, more praise follows. "Unbelievable," one woman tells them. "Lovely, inspiring," says another. As the girls' mother Lea helps them pack up for the 100-mile drive home to Stephentown, N.Y., their father Marcel looks dazed by the experience. "This is what I wait for," he says. "It's what it's all about." At an age when most kids would shock their parents just by playing classical music on their iPods, the Parnas girls are already veterans on the performance circuit. They've been in chamber music recitals, soloed with other professional orchestras and triumphed in a handful of regional competitions. Madalyn, 16, has played on an NPR show spotlighting young musicians; 14-year-old Cicely, as this story was written, was one of three cellists in the junior-division finals of the American String Teachers Association's national solo competition. Says violinist James Buswell, who gives master classes at the New England Conservatory and coaches Madalyn in violin and both girls in chamber music: "These kids are both in the very top echelon of talent for their age." They are also stretching their parents' finances to the breaking point. Marcel, 44, a software engineer and the family's sole breadwinner, earns a comfortable $135,000. But Lea, 53, figures they'll spend more than $40,000 this year on the girls' music, covering everything from lessons to the gas required on the long drives to competitions. And that's after shelling out nearly $200,000 last year when both girls needed new instruments. The goal is to net each daughter a coveted spot in a music conservatory and prepare them for careers as full-time musicians. Toward that end, Marcel and Lea have gutted their own retirement savings, borrowed heavily, nixed financial safety nets such as adequate life insurance and emergency funds - and shivered through subfreezing winters in a poorly insulated, underheated house. 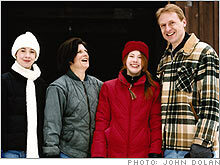 The Parnas family's situation is extreme but not unique; the challenges could just as easily apply to, say, gymnastics, soccer or chess as to music. A child who loves a particular activity and can do it well, maybe even spectacularly well, puts parents in a financial quandary. In the best of all worlds, supporting that talent could give the child a leg up when applying to college, earn him a scholarship or help launch a well-paying career. But the further a child progresses in what is likely to be an extremely competitive field, the more parents end up spending for lessons, equipment and myriad other expenses and the greater the financial gamble. "It's a constant escalation," says Lea. In order to finance their daughters' musical training, Marcel and Lea have had to scramble. The family has already scrimped in the obvious places: Vacations and meals out are a distant memory, they've put off much needed repairs on their house, and for years the girls have been clothed in hand-me-downs from friends. They're always on the lookout for other ways to pay for their daughters' lessons and equipment. So three days after the concert, Lea embarks with Madalyn and Cicely on a 2,500-mile road trip to Montgomery for a secondary school classical music contest in which the first prize is $10,000. "This was the biggest money competition I could find," says Lea. Madalyn was five and Cicely four when Marcel and Lea signed them up for string music lessons. Making your child study an instrument is a ritual of American parenting, but the Parnases' interest in music ran deep. Lea, an engineer who gave up her career to raise the girls, used to teach piano. Marcel, son of cellist Leslie Parnas, studied piano as a youth. There was no instant miracle. "It wasn't like we gave them an instrument and the world caught fire," says Marcel. The violin and cello lessons were only one of many activities the girls pursued. They studied ballet and piano. They rode horseback. The girls also ended up being home schooled by Lea after Madalyn's elementary school announced its impending closure. The parents didn't realize quite how well their daughters played until Madalyn, at 10, entered the annual student competition at the nearby Berkshire Music School. Up against about a dozen other students, mostly teens, she became the youngest winner in the contest's history. "I was shocked," says Lea. A year later, Cicely won. She was nine. Slowly, the girls' music began to overtake the family's lives and finances. As their playing improved, they moved on to more expert - and more expensive - teachers. Over the next four years, the cost of music lessons shot up from $80 a week for both girls to $150 for Cicely and $210 for Madalyn. "That's when you take a big gulp," says Marcel. They needed higher-quality instruments too. Cicely's first cello cost $1,000; the second, salvaged from her grandfather's closet, required $4,000 to fix up. Madalyn's first full-size violin, bought in 2002, cost $18,000. But encouraged by teachers who assured the Parnases that their daughters were something special and by the girls' own passion for music, Lea and Marcel didn't question the costs. By 2004 the couple were spending $35,000 a year on the children's music. More than $13,000 went for each girl's lessons. 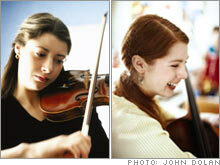 Coaching the kids in chamber music cost $3,700 a year. Hiring piano accompanists to help them rehearse violin and cello concertos ran another $1,300, while more than $1,100 went for the gas required to drive the girls to their lessons as far away as Poughkeepsie (75 miles). Marcel and Lea knew their spending was getting out of control. But they believed then, and still do, that they owe it to their daughters to foster their potential, no matter what it takes. "These kids are extraordinary talents," says Lea. "But the costs are ridiculous." The family might have saved money by selling the horses, but that wasn't an option for Lea. "Horses are like people in our home," she says. "They're with you until you bury them." Instead, the Parnases borrowed against their house and ran up their credit-card balances. Still desperate for cash, they withdrew $72,000 from Marcel's retirement accounts, paying income tax and a 10% penalty. But a year later, Lea was back to worrying how the family could stay afloat. They looked for scholarships, but found none at the pre-college level for families with their income. That's when Lea hit upon a strategy to alleviate at least some of the financial pressure: Speed up the girls' homeschooling so they could start college early, get scholarships and be educated on someone else's dime. It worked. Thanks to the accelerated schedule, Madalyn is slated to graduate from homeschool high school this summer, two years early. She already has a full scholarship to the College of Saint Rose, a school in commuting distance with a good music department. Are the girls being pushed too hard, too fast? Not according to those who know them. They work hard, says their chamber music coach Buswell, but with a healthy exuberance for what they do. "They're not what we call practice-room vegetables," he says. And both girls seem to take real delight in their music. Madalyn talks excitedly about the persistence and patience the violin demands and her intense satisfaction with getting a difficult passage just right. "Once you achieve that goal," she laughs, "you're so happy you want to dance." And while they each spend hours practicing every day, neither Cicely nor Madalyn sees much sacrifice in their existence. "Music is something that's part of my life and has to be there," says Cicely. "It's such an emotional vent." The girls are only vaguely aware of the strain their training has put on the family's finances. Lea and Marcel, on the other hand, worry constantly about money. Lea fears they will run out of money before the girls are successfully launched in musical careers. "To come so close and not complete it would be a heartbreak," she says. Marcel worries that the family has no money to fall back on in an emergency and frets about whether the girls can make a solid living pursuing their dream. "Most musicians I know have five different jobs," Marcel says. "They're always scrambling." The competition in Montgomery - the one with the $10,000 prize - underscored those concerns. After four days of driving and rehearsals, each sister performed in a near-empty chapel for three judges. Two hours later, they learned that neither one had made the cut of nine, from a field of 69, who advanced to the next round. The results also dashed the family's hopes that the prize money might help with their latest crisis: an $85,000 tax bill that must be paid this month. A year ago, Marcel received a $222,000 windfall when his company was bought out and his stock options vested. The couple used the money to pay down debt and set aside $100,000 for taxes. But they ended up using that cash later in the year to buy higher-quality instruments - a $40,000 cello for Cicely and a $115,000 violin for Madalyn. "We tried less expensive ones, and they were seriously flawed," says Lea, explaining that the girls had outgrown the instruments they were playing. And while it may seem crazy to outsiders to spend six figures on a violin for a teenager, Lea and Marcel didn't want the girls to be held back by inferior instruments. Given the choice between what they felt their daughters needed and what the family could afford, as always, the girls won. To help the Parnases get their finances in order, Money Magazine recruited Sarah Hussey, a financial planner in Bridgewater, N.J. who is also a professional horn player. Attack the debt first To pay the tax bill and their remaining credit-card and homeequity debt, Hussey advises the Parnases to do a cash-out refinancing of their mortgage, on which they now owe about $64,000. If they take out a new 30-year fixed-rate $200,000 loan at 6.5%, they can pay off what they owe and still have more than $30,000 left to put in a money-market account as a cushion for future expenses. Despite higher mortgage payments, Hussey figures the couple's cash flow will improve about $5,000 a year through a combination of lower interest rates, bigger tax deductions (since the interest on the mortgage is deductible) and the interest they'll earn on the money-market account. Balance income and outgo Hussey estimates that the Parnases currently spend about $25,000 more a year than Marcel makes. So the cash cushion from the refinancing will give them a one-year window to make radical changes. "There are only two things you can do - bring more money in or spend less," the planner says. But when she suggests that the girls could get by with fewer lessons, Lea rejects the advice, noting that some parents fly their kids halfway across the country to study with the best. The planner then proposes that Lea get a job. But Lea, ticking off her responsibilities - cooking, shopping, tutoring and driving - shoots down that idea as well. "Everybody's life would become hell," she laughs, saying she'll return to work in a few years when the girls have left home. Hussey's skeptical response: "Can you get hired at 60?" If the Parnases are unwilling to make changes, she notes, their situation will undoubtedly worsen; the only question is how much. Buy protection Marcel has a $135,000 term life insurance policy through work - not nearly enough to educate and support the girls if he dies prematurely. Hussey recommends Marcel buy a $500,000 10-year term policy; Lea, a $250,000 policy. Cost: around $1,000 a year. Lea cringes at this advice, confessing a fatalistic disdain for life insurance. "If I'm alive, we're on track," she says. "I die, it's over. They better become waitresses." The histrionics don't move Hussey, who retorts calmly, "It's so simple to provide basic financial security." And while the planner would love to see Marcel and Lea start saving in earnest for their own retirement, she understands that it's a hopeless cause. She says, "They are investing everything in the girls' future and possibly making themselves dependent upon the girls' success for their support later in life." Get the girls on track Madalyn and Cicely will each earn at least $1,000 this year, partly from fees for concert appearances. Hussey urges the girls to set part of those earnings aside in a long-term savings account. "I work with older musicians who have a lot of money, and some who have little money," she says. "The ones who have a lot started saving early and kept at it." Marcel likes the idea. "They will easily understand the difference," he says, "between the right thing to do with income and what we're doing." Eventually, the discussion is interrupted by three young people hungry for dinner: Madalyn, Cicely and Alex Grimes, 16, a viola player the girls met at Boston University Tanglewood Institute last summer and with whom they've formed a string trio. Alex, who lives in Virginia, has come north to record an audition DVD with the girls for a chamber music competition in May. After the meal, the kids play part of the Beethoven piece they'll be recording. Beautiful melodies cascade down the octaves from Madalyn to Alex to Cicely. Listening intently, Hussey pronounces, "There are few undergraduate chamber groups as good as that." She isn't the only one listening closely that evening. Within days the Parnases decide to refinance their mortgage as advised. And Lea e-mails Hussey that she'll look for a job once Madalyn starts college. The couple, finally, are facing the music.